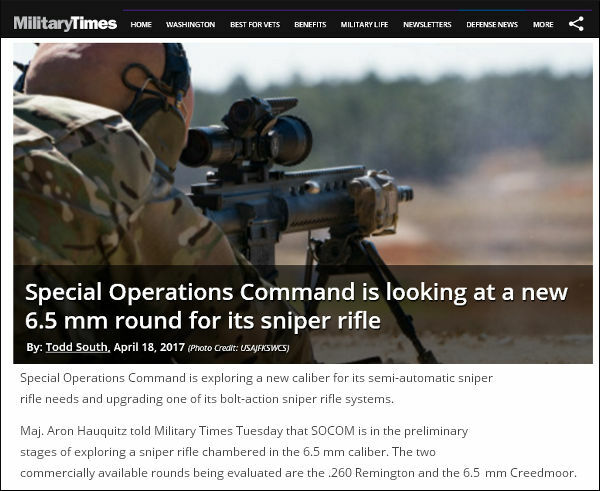 “Major Aron Hauquitz told Military Times Tuesday that SOCOM is in the preliminary stages of exploring a sniper rifle chambered in the 6.5 mm caliber. The two commercially available rounds being evaluated are the .260 Remington and the 6.5 mm Creedmoor. Research shows that both rounds will ‘stay supersonic longer, have less wind drift and better terminal performance than 7.62 mm ammunition’, SOCOM officials said. 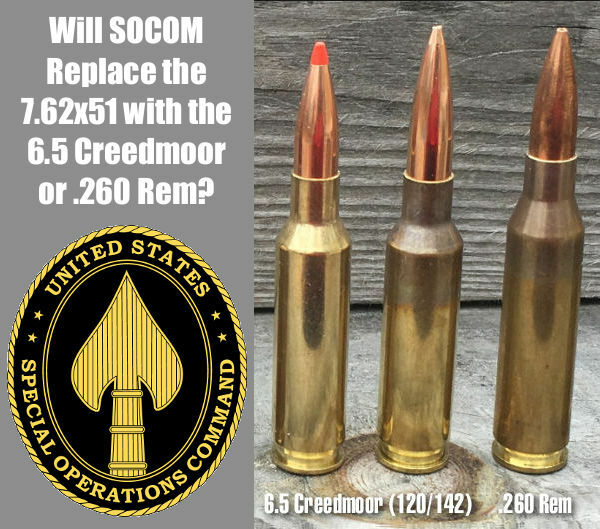 The SOCOM representative indicated that test rifles in 6.5 Creedmoor and/or .260 Remington might be issued to test teams later this year, but there was no issue date in place yet. Hauquitz said the 6.5 mm exploration came out of preliminary results of the Small Arms Ammunition Configuration study, which assesses commercially available ammunition and new ammo technologies. The Military Times report also revealed that SOCOM is considering polymer-cased rifle ammunition, with the goal of reducing load weight. 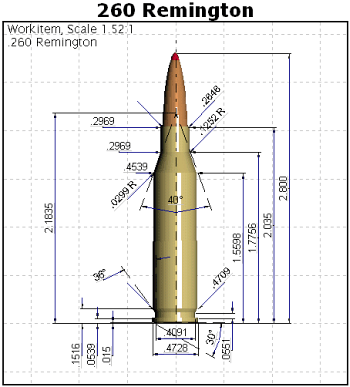 SOCOM’s research shows that a polymer-cased mid-sized 6.5 mm cartridge could be one-third lighter than conventional brass-cased 7.62×51 ammo. That means the next-generation 6.5 mm ammo could “come in at 5.56×45 mm weight ranges”. While SOCOM is seriously looking at this new option, polymer-cased ammo will NOT be required for SOCOM’s new semi-auto rifle. In other words, if the polymer ammo is not ready, that “would not delay potential fielding of a 6.5 mm rifle” according to Maj. Hauquitz. 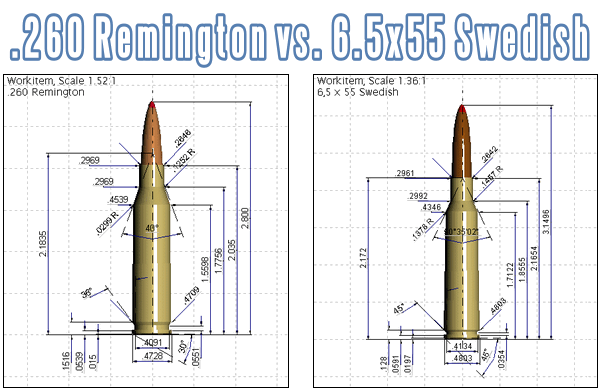 Share the post "SOCOM Considers New 6.5 mm Chamberings for Semi-Auto Rifles"
Are you a fan of 6.5mm rifle cartridges? Then you should visit TargetShooter Magazine and read Laurie Holland’s latest “magnum opus”. Laurie recounts the development of 6.5mm rifle cartridges and examines a host of “six-fives” including the well-known 6.5×55 Swede and more esoteric cartridges such as the 6.5×58 Vergueiro. Laurie looks at a variety of military 6.5mm cartridges, including Japan’s 6.5×50 Arisaka, as well as some big 6.5mm Magnums. This Editor shot a .260 Remington (essentially a necked down .308 Win) for quite a while. 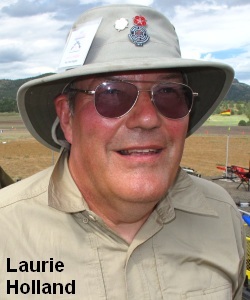 I was pleased to see that Laurie discusses the .260 Rem, along with its bigger brother, the 6.5-06. In early 20th century the 6.5x54mm Mannlicher-Schoenauer was a highly-regarded hunting cartridge. Thanks to the 6.5X55mm and its common name of ‘Swedish Mauser’ (it was a joint Swedish / Norwegian military development truth to tell), not forgetting first rate Lapua, Norma, and Sako ammunition and components, many associate the 6.5s with Scandinavian countries. However, the two Nordic nations weren’t alone in adopting 6.5mm designs during the back end of the 19th century, moreover Germany and Austria did as much to popularize the caliber. The Netherlands, Italy, Japan, Romania, Portugal and Greece took the small caliber military route too, although some later decided to convert at least partially to larger bores. However, once armies started to adopt lighter, pointed bullets at improved velocities in the .30-class designs starting with the German 7.92mm 153gr bulleted S-Patrone of 1905 which produced the then astonishing MV of 2900 fps in the G98 rifle, the 6.5s lost out as contemporary propellants couldn’t handle smaller calibers as efficiently. It’s significant that while some early users moved to larger caliber service rifles, no country [other than Japan] has adopted 6.5mm in the last 110 years although there have been some unsuccessful initiatives recently. Prior to WW2, there had only been a single American attempt to produce a 6.5, the brilliant cartridge designer and riflemaker Charles Newton with his eponymous 256 design of 1913 which used a shortened and necked-down 30-06 case. The Western Cartridge Company loaded ammunition for Newton, a 129gr expanding bullet at a claimed 2760 fps MV and obtained in a longer barrel than those fitted to production rifles. RWS introduced the powerful 6.5X68mm in 1939 and it is still in use in Europe. Share the post "6.5mm Cartridge Overview — Laurie Holland’s Opus"
Many tactical shooters have adopted the .260 Remington as an alternative to the heavier-recoiling .308 Winchester. 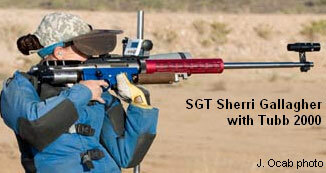 The .260 Rem has also performed well in the hands of long-range High Power shooters such as SSG Sherri Jo Gallagher, past National High Power Champion. 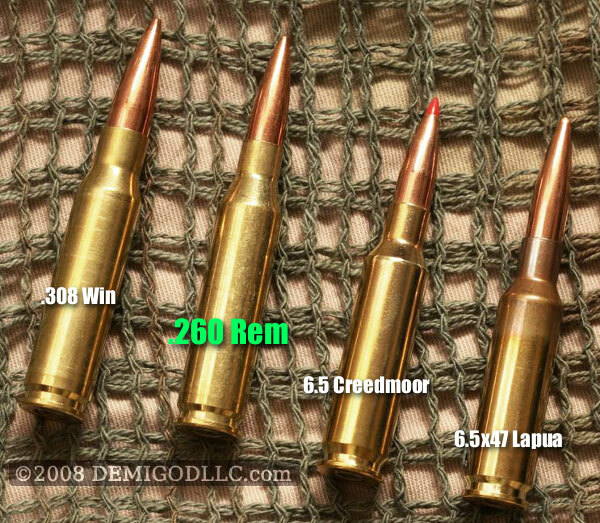 The .260 Remington is basically the .308 Win necked down to .264 (6.5 mm) caliber. It can launch very high-BC 130-142 grain projectiles at impressive velocities. The ballistics of the .260 Rem allow it to shoot flatter, with less wind drift, than typical .308 Win loads. For fans of the .260 Remington, very high-quality factory ammo is now available. ABM Ammo, a division of Berger Bullets just announced that it will produce two varieties of .260 Remington ammo. 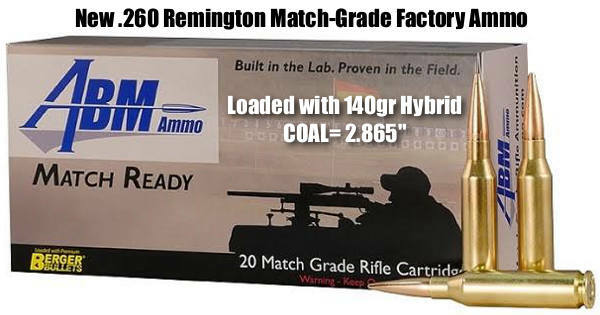 ABM’s 260 Remington 140gr Berger Match Hybrid Target ammo is designed for class-leading ballistic and superior accuracy. Using the highest-BC 6.5 mm caliber bullet offered by Berger, the 140gr Hybrid, this load features less wind deflection and more energy on target than the competition. ABM claims that this Match Hybrid ammo is “unrivaled as a long-range 260 Remington factory ammo option.” Since it pushes a higher-BC bullet than other .260 Rem factory ammo, we’d have to agree with that statement. Performance based on a 26″ barrel and sea level conditions. 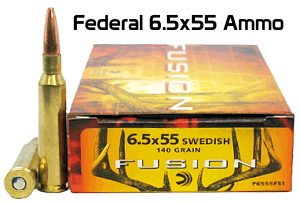 ABM Ammo also offers .260 Rem factory ammo loaded with the NEW 130gr AR Hybrid bullet. The .260 Rem 130gr Berger Match AR Hybrid OTM Tactical load is optimized for the AR-10 platform or any magazine-fed rifle. 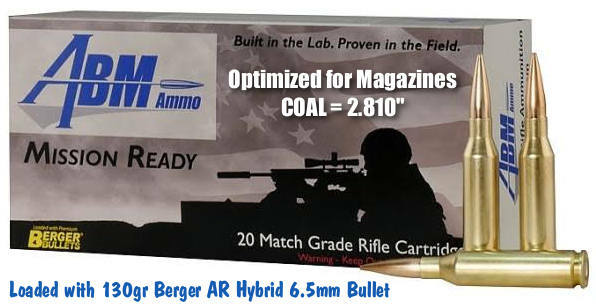 Berger’s 130gr AR Hybrid bullet offers a 0.290 G7 BC. That’s very close to the 0.317 BC of the longer 140gr Hybrid. This, combined with a 2847 FPS muzzle velocity, provides excellent performance in a shorter COAL that feeds perfectly from box magazines. Because the ballistics are so close, you may want to try both loads in your .260 Rem rifle, even if you single-load and are not restricted by mag length. Some barrels may have a preference for one bullet over the other. 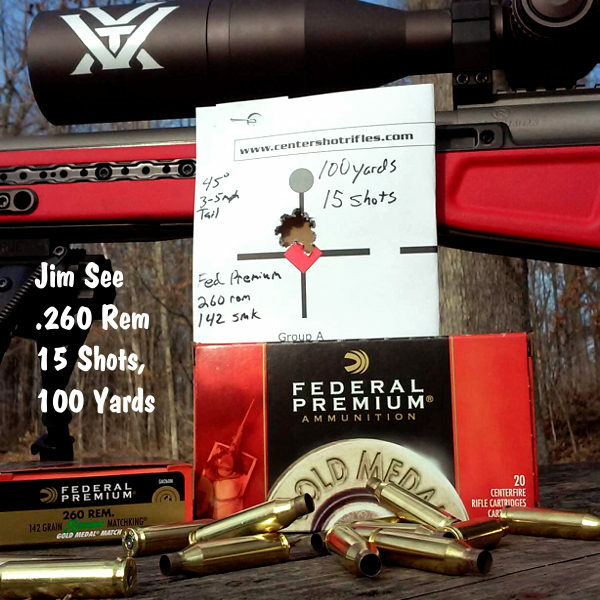 Share the post "ABM Ammo Releases .260 Rem Ammunition with Berger Hybrids"
Chart created with Ammoguide’s Visual Comparison Tool. Visit Ammoguide.com to learn more. The current popularity of 6.5mm cartridges in the USA has been a long time in coming. I won’t go into my opinions on why it took so long to catch on. The important thing is that it finally HAS caught on and we’re now so fortunate to have a wide selection of 6.5mm cartridges to choose from! 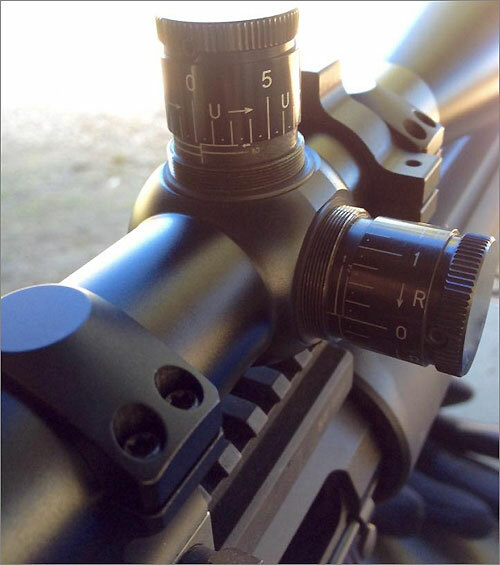 6.5mm Grendel – Developed by Alexander Arms for the AR15 and military M4 family of rifles. The Grendel fits the dimensional and functional requirements of these rifles while delivering better lethality and downrange performance. 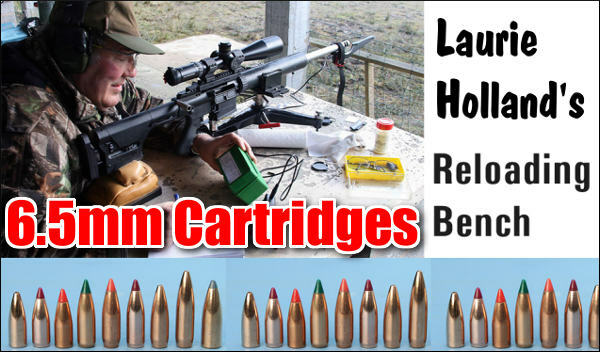 There are now similar cartridges from other rifle companies. We chamber for the Les Baer “264 LBC-AR”. Designed for velocities of 2400-2500 fps with 123gr bullets, it shoots the 140-grainers at about 2000 fps (for comparison purposes). 6.5mm BRM – Developed by E. Arthur Brown Company to give “Big Game Performance to Small Framed Rifles” — namely our Model 97D Rifle, TC Contender, and TC Encore. Velocities of 2400-2500 fps with 140gr bullets puts it just under the original 6.5×55 Swede performance. 6.5mm x 47 Lapua – Developed by Lapua specifically for international 300m shooting competitions (with some interest in long-range benchrest as well). Case capacity, body taper, shoulder angle, and small rifle primer are all features requested by top international shooters. You can expect velocities of 2500-2600+ with 140 gr bullets. 6.5mm Creedmoor – Developed by Hornady and Creedmoor Sports, the 6.5mm Creedmoor is designed for efficiency and function. Its shape reaches high velocities while maintaining standard .308 Winchester pressures and its overall length fits well with .308 Win length magazines. You can expect velocities of 2600-2700+ fps with 140gr bullets. .260 Remington – Developed by Remington to compete with the 6.5mmx55 Swedish Mauser that was (finally) gaining popularity in 1996. 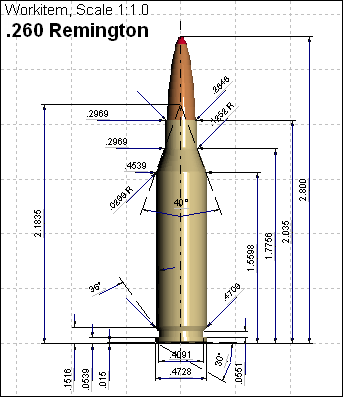 By necking down the 7mm-08 Remington to 6.5mm (.264 cal), the .260 Remington was created. It fit the same short-action [receivers] that fit .308 Win, .243 Win, 7mm-08 Rem, etc. 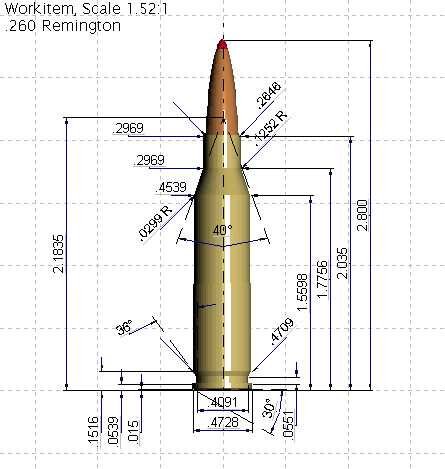 You can expect velocities of 2600-2700 fps with 140gr bullets in the 260 .Remington. 6.5mm x 55 Swedish Mauser – This was the cartridge that started the 6.5mm craze in the USA. It is famous for having mild recoil, deadly lethality on even the biggest game animals, and superb accuracy potential. Original ballistics were in the 2500 fps range with 140gr bullets. Nowadays handloaders get 2600-2700+ fps. 6.5-284 Norma — This comes from necking the .284 Winchester down to .264 caliber. Norma standardized it for commercial ammo sales. The 6.5mm-284 was very popular for F-Class competition and High Power at 1,000 yards. However, many F-Class competitors have switched to the straight .284 Win for improved barrel life. 6.5-284 velocities run 3000-3100+ fps with 140gr bullets. .264 Winchester Magnum – Developed by Winchester back in 1959, the .264 Win Mag never really caught on and may have delayed the ultimate acceptance of 6.5mm cartridges by US shooters (in my opinion). It missed the whole point and original advantage of 6.5 mm cartridges. The special needs of long-range competition have skewed things a little. 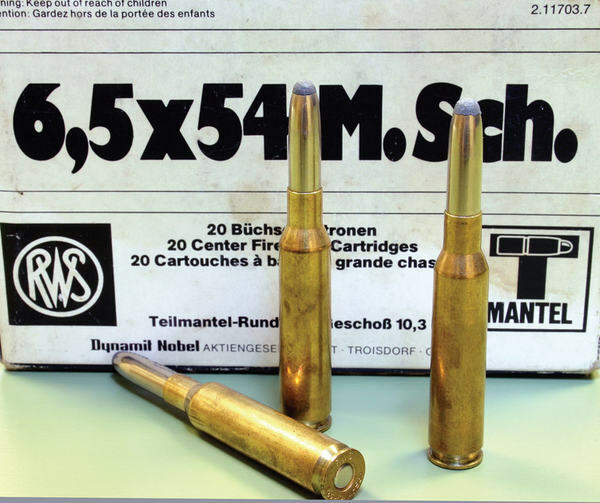 However the original advantages of 6.5mm cartridges — how deadly the 6.5mms are on game animals, how little recoil they produce, and how easy they are to shoot well — still hold true today. Share the post "Quick Comparison of Popular 6.5mm Rifle Cartridges"
The Great Debate: .260 Rem vs. 6.5×55 — Which Is Better? “The 6.5×55 case has 6 or 7% more capacity than the .260s, even more in practice when both are loaded to standard COALs with heavy bullets, which sees them having to seated very deep in the .260 Rem using up quite a lot of powder capacity. So loaded up for reasonable pressures in modern actions, the 6.5×55 will give a bit more performance. The issue for many is what action length is available or wanted, the 6.5 requiring a long action. So sniper rifle / tactical rifle competitors will go for the .260 Rem with the option of the many good short-bolt-throw designs around with detachable box magazines. If a bit more performance is needed, the .260AI gives another 100-150 fps depending on bullet weight. For purely target shooting, I think I’d go with 6.5×55 if I was making the choice again today for performance and brass-preparation reasons. In fact, I’ve considered going back to the gunsmith to have the barrel rechambered. You want a multi-purpose rifle though and that makes things trickier depending on the bullet weight(s) you want to use. The [typical] 6.5×55 and 6.5-08 throats are really designed for 140s, so 90-120s make a long jump into the rifling. If you’re always going to use 130s and up, it’s less of an issue. If you want to use the lighter stuff, I’d say go for .260 Rem and discuss the reamer with the gunsmith to come up with as good a compromise as you can depending on the mix of shooting. 1:8.5″ twist is the norm and handles all the usual sporting and match bullets; you can go for a little slower twist if you won’t use the heavies. Over here in the UK, in Scotland to be precise, we have a top sporting rifle builder (Callum Ferguson of Precision Rifle Services) who almost specializes in .260 Rem usually built on Borden actions. He throats the barrel ‘short’ so it’s suited to varmint bullets, but will still handle the 100gr Nosler Partition which he says is more than adequate for any British deer species including Scottish red stags. “There is just one small item that has been missing from this conversation — the 6.5×55 has a non-standard rim diameter of .479″ vs. the standard .473″ of a .308 and all of its variants. Depending on your bolt this may be an issue, or it may not.” — Neil L.
Share the post "The Great Debate: .260 Rem vs. 6.5×55 — Which Is Better?" If you’ve ever lusted for a SAKO TRG42 in .338 Lapua Magnum, now’s the time to break out the checkbook. This could be the deal of the decade. EuroOptic.com is selling brand new, .338 LM SAKO TRG42s for just $2250.00. That is not a misprint. For a limited time (while supplies last), EuroOptic is offering AccurateShooter.com readers new TRG42s in .338 Lapua Magnum for just $2250.00 — that’s over $1000.00 cheaper than the price at some other gun vendors. This was a special purchase, and inventory is limited, so don’t delay. The TRG42s have black furniture with a matte black barrel finish (not phosphate), and no Picatinny rail. The $2250.00 price applies only to black-stock models, chambered in .338 LM. Shop around and you’ll see you can’t come close to this price on a new TRG42 anywhere else. 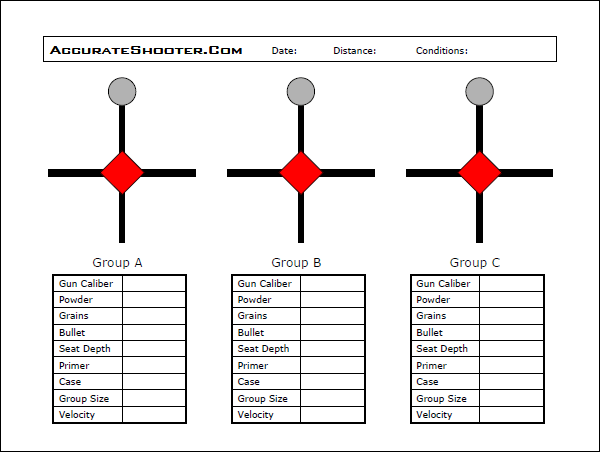 If you order, mention AccurateShooter.com to get the $2250.00 special price. Want a SAKO TRG22 chambered in .260 Remington? Well you won’t find one at your local gunstore. EuroOptic.com commissioned a special run of .260 Rem TRG22s, SNs 0XX-200, and they are now in stock. These are fitted with 26″, 1:8″ twist, black phosphate-coated barrels. Actions come with milspec Picatinny rails pre-installed. Four different stock finishes are currently available: Matte Black, Remington Green, Desert Digital Camo, and Woodland Digital Camo. The Camo stock sets are an Eurooptic exclusive — not available anywhere else. These are very special rifles, and with the high interest in the .260 Rem cartridge (which won the National High Power Championship in the hands of SGT Sherri Gallagher), you can expect the rifles to sell out quickly. Price for the .260 Rem TRG22s in black and green is $3100.00. The Digital Camo versions are priced somewhat higher, at $3350.00. Shown below is a the TRG22 in Desert Digital. If you have questions, call (570) 220-3159 and ask for Jason Baney. CLICK HERE for sale info and rifle specs. Share the post "EuroOptic’s Super Deal on SAKO TRG42 in .338 Lapua Magnum"
While the venerable .308 Winchester is still the chambering of choice for most tactical shooters, a growing number of tac competitors are switching to the 6.5 Creedmoor (as well as other 6.5mm chamberings such as the 6.5×47 Lapua and .260 Remington). Among the 6.5mm options, the 6.5 Creedmoor offers the advantage of high quality, relatively affordable factory ammo. 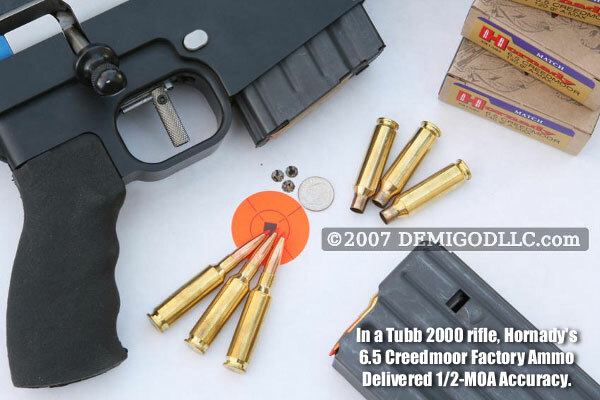 6.5 Creedmoor — .260 Done Right? Put in order of ballistic performance, the 6.5 Creedmoor and the .260 Remington are almost neck-and-neck, pushing the same weight bullets at about the same velocities from almost identical case capacities. The 6.5×47 Lapua in factory form lags by 100 to 200 fps due to less powder capacity; however, it has already gained a reputation for having a strong case that puts up with the high pressures some reloaders push in their custom rifles. 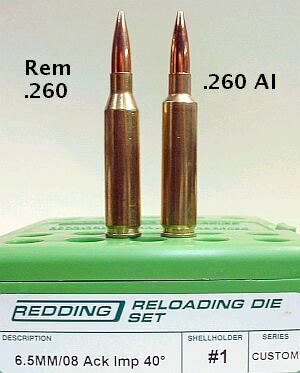 The .260 Remington’s main problem for the reloader is lack of high-quality and affordable brass and to date there has only been one factory load produced which was appropriate for serious long-range competition for the non-reloader. The 6.5×47 was designed for intermediate-range competition and very accurate ammunition is available from Lapua; however, these factory loads are at a ballistic disadvantage at long range compared to the .260 Remington and the 6.5 Creedmoor. There will always be those who bash new cartridges, claiming that they don’t do anything better than their favorite cartridge. By this logic, we’d all be shooting .30-06. Put simply, the 6.5 Creedmoor is what the .260 Remington should have been. It looks like Hornady has the right mind-set to make its new cartridge a success in the competitive and practical market, unlike Remington who basically let the .260 languish in a few hunting rifles. The 6.5 Creedmoor enjoys additional case capacity over the 6.5×47 Lapua, which allows better ballistics at a lower peak chamber pressure. Share the post "6.5 Creedmoor Finds Favor with Tactical Competitors"
You’ve probably heard by now, but this is big news, so it bears repeating. 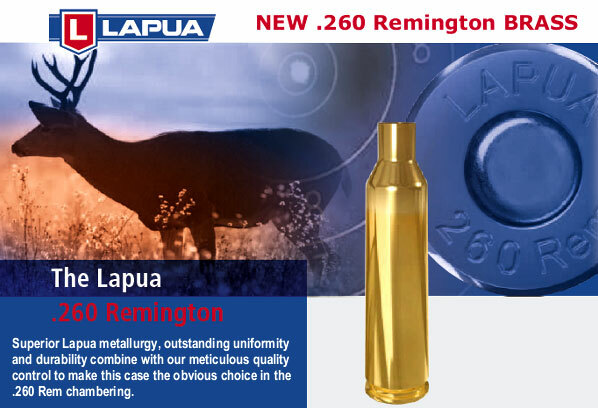 Lapua has started production of .260 Remington cartridge brass. Lapua hopes to deliver the first shipments to the USA by late March, 2011. This is a very positive development for hunters, high power shooters, and tactical shooters. With the latest generation of powders (including Reloder 17), the .260 Remington is a potent cartridge with the 140gr-class bullets, and it hammers with the Lapua Scenar 123s or Berger 130s, and H4350-speed powders. In the video below, Kevin Thomas, Lapua’s USA Marketing Manager, provides more specifics about the .260 brass, and Lapua’s other new-for-2011 products. On the bullet front, Lapua is proudly rolling out its new “L” series of projectiles, starting with the 6mm 105gr Scenar and then expanding to the whole Scenar match bullet line. 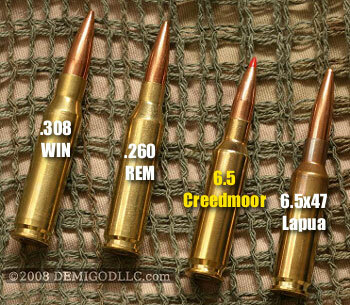 NOTE: These are NOT new bullet designs — Lapua is not changing the bullet shapes, weights, or internal construction. So you’ll be getting the same bullets, only with tighter tolerances, and improved quality control. Lapua has tightened its production tolerances for the L series of bullets. 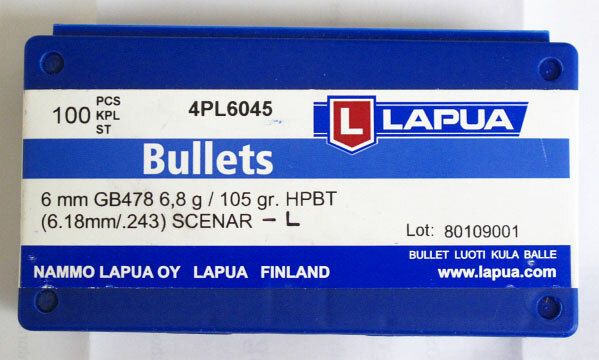 Lapua claims that the L series of bullets will be more uniform in weight, with improved concentricity. Length from base of bullet to ogive will be held to very tight tolerances. 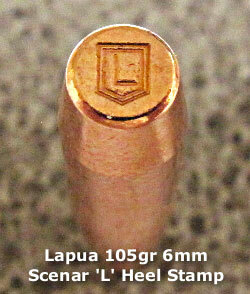 Apart from the notations on the box, the new Lapua L bullets will be marked with an “L” crest stamped on the bullet heel. Lapua claims this tiny stamp will not affect accuracy nor reduce the bullet’s ballistic coefficient. Are the new Scenar “L” series bullets actually more uniform than previous Scenars (which were really very, very good)? Based on my quick test of 20 sample bullets pulled at random from a box, I would say the 105gr Scenar Ls are some of the most uniform factory bullets ever. Adam Braverman gave me a box of the new 105gr Scenar “L” bullets. I randomly chose twenty (20) bullets, and measured them base to ogive using a Hornady comparator. With the exception of one bullet, everything was pretty much “dead on”. I listed two at 0.7125″, but they were awfully close to the others. Basically, except for the one bullet measuring 0.711″, they were all the same within the practical resolution of my calipers. Very impressive indeed. Next I checked for weight uniformity. I weighed each of the 20 bullets twice, using a calibrated RCBS ChargeMaster scale. NOTE: This is NOT a lab quality scale. 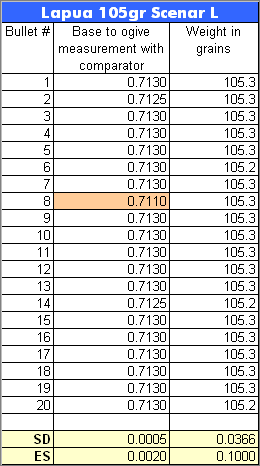 The 0.1 grain total spread among the bullets is within the scale’s range of error. But I did weigh each bullet at least twice, and the ones that were one-tenth of a grain light I weighed four times. Three bullets out of the twenty measured 105.2 grains. All the rest were 105.3 grains. Remarkable. Share the post "SHOT Show Report: Lapua .260 Rem Brass and “L” Series Bullets"
Here is great news for high-power shooters, tactical competitors, and hunters. 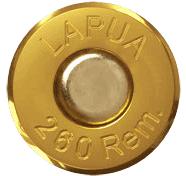 Lapua will be producing .260 Remington brass starting in 2011. The official announcement will be made at SHOT Show 2011 in Las Vegas, and brass should start arriving in early spring. With Lapua’s introduction of .260 Rem brass, precision shooters now have a “no-brainer” first choice for cartridge brass in this popular chambering. No longer will you have to sort and cull (and re-sort) Rem-brand .260 brass. And you won’t have to fool around necking-up .243 brass or necking down .308 brass, with the problems that come with case-reforming operations. The .260 Rem was used to stunning effect at Camp Perry to win the 2010 Championships setting an incredible new national record in the process. .260 shooters have hammered their way into the winner’s circles of a wide variety of competitive disciplines, a real testament to the capability of this outstanding cartridge. The .260 isn’t just a target round. It has also shown itself to be a fine performer in the field for medium game. 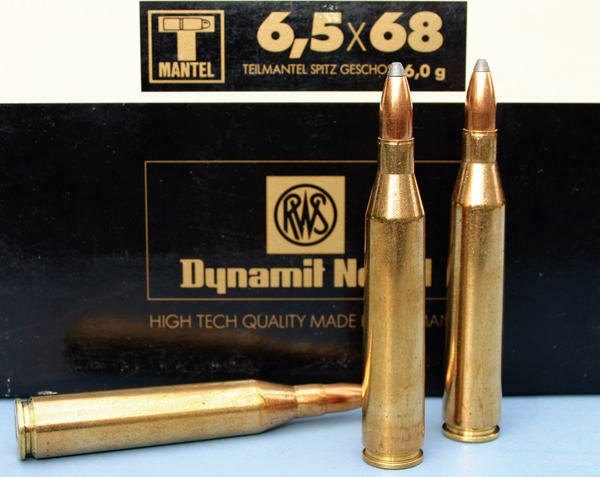 Effectively duplicating the ballistic performance of the time-honored 6.5×55, the .260 has already developed a well-earned reputation for dependable stopping power on deer, antelope and similar game. Given the tremendous selection of bullets for every conceivable application, the 260 is an extraordinarily versatile cartridge. With such a solid history already established in such a short time, Lapua is proud to add the .260 to our line of premier components for the handloader. Share the post "Lapua Commences Production of .260 Rem Cartridge Brass"
Following SGT Sherri Gallagher’s record-setting victory in the 2010 NRA High Power National Championship, many readers have asked what caliber (chambering) Sherri was shooting. Well, Sherri was shooting a .260 Remington at all yardages, as confirmed by SFC Emil Praslick, USAMU rifle coach. Runner-up Carl Bernosky was shooting a 6mm Hagar in an AR-platform rifle. To learn more about the .260 Rem, read Zak Smith’s article: 6.5mm Shootout: .260 Remington vs. 6.5×47 Lapua vs. 6.5 Creedmoor. Zak compares three popular 6.5mm cartridges, weighing the pros and cons of each. 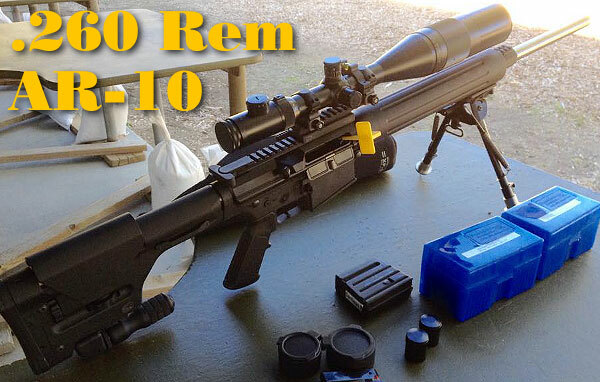 Zak himself shoots the Rem .260 loaded with 139gr Lapua Scenar bullets and Alliant Reloder 17. Share the post "Sherri Gallagher Uses .260 Rem to Win National HP Championship"